Catherine has painted in, demonstrated and taught art workshops in a variety of gardens, leading to individual and group exhibitions. Green spaces, wild places September 2011. Paxton House, Scottish Borders. 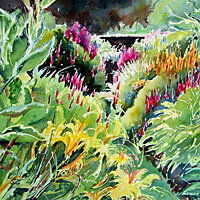 Two-artist exhibition combining garden and landscape themes from Scottish subjects. Impressionist Gardens of the North Durham Botanic Garden Spring 2008. 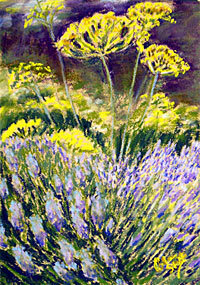 Paintings from Northern Gardens - from gardens all over Cumbria Northumbria and Yorkshire. An exhibition of paintings based on gardens of the Eden valley- Acorn Bank, Dalemain, Winderwath, Levens, and the gardens and writings of Cumbrian writers. Ruskin, Wordsworth and Auden: expressing a sense of natural beauty both within and beyond the garden wall, at Rydal and Brantwood, in Aira force valley and on the limestone pavements at Grange scar. "Art in the Garden" at Crook Hall, Durham An annual Arts event taking place during the August opening of this medieval property.2005/6. The group of artists combined to workin, demonstrate and exhibit during the Summer season. Artists in Alnwick Garden group initially worked in the garden during part of the building phase in 2004 and then at various dates over several years. Work exhibited at Kielder Castle Gallery in 2005 and in artists open studios.